Holidays on the holiday island of Corfu provide the visitor the opportunity to see beautiful beaches, lush mountains and picturesque bays - just a three hour flight from the UK. 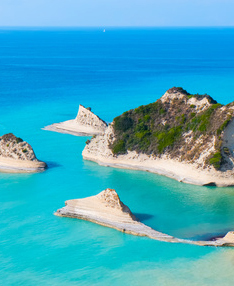 Corfu is the closest Greek island to the UK and is especially popular with holidaymakers seeking sun, sea and sand. Holidays in Corfu are not complete without a visit to the island's capital, Corfu Town. Here visitors can explore the 14th-century old quarter, with its colourful houses, Venetian architecture and cobbled streets. Corfu hotels come in all varieties from small family run bed and breakfast accommodation through to some of the best all inclusive Greek island hotels. Set on the north coast of Corfu the lively resort of Sidari is approximately 26 miles north of Corfu town and the airport. The resort has developed from a couple of small fishing villages and is still growing. A firm favourite with British holidaymakers it has plenty of bars and tavernas, lots of shops and a choice of three beaches. Most bars and tavernas in Sidari offer Greek and British food; however, there are some cafes and restaurants, offering varied cuisine to suit everyone's taste. Sidari's nightlife is definitely on the lively side. Numerous bars, tavernas, music bars and clubs are available offering a variety of entertainment. 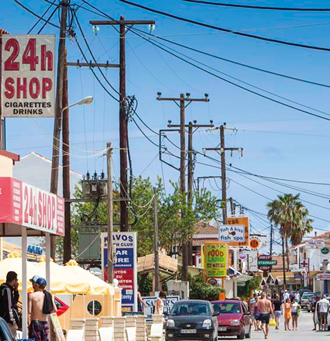 A Kavos holiday offers entertainment from sunny day time leisure pursuits, to buzzing sun-down to sun-up bars and clubs. Kavos is situated on the southern tip of Corfu, forty-eight kilometres from Corfu Town. It is a lively resort geared to the younger crowd with countless bars, discos and clubs where they can party until dawn. The beach is almost eight kilometres long and offers a comprehensive range of water sports. The tavernas and restaurants serve a wide range of cuisine including English pub food for the less adventurous palates. 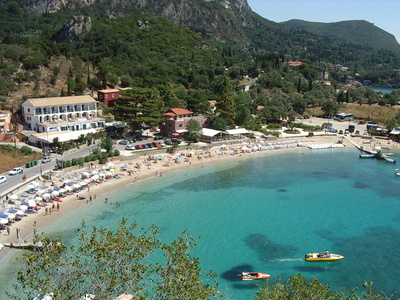 Kassiopi is a quite lively resort situated at the north east corner of Corfu. The resort is still a working fishing village where you can see the local fishermen bringing in their catch at the end of the day. The town and its surrounding area have developed in to a thriving holiday resort that provides something to suit all holiday makers. 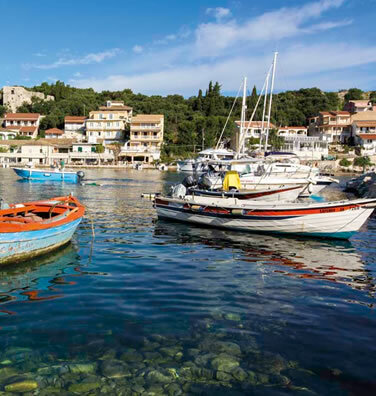 Kassiopi is a main port for trips all over the island of Corfu by both boat and coach. The accommodation here is mainly the apartment type, with larger some villa accommodation on the outskirts of the town. The resort is lively day and night and attracts a mix of visitors. Paleokastritsa has it all and is said to be one of the most scenic spots in the whole of Greece. The resort consists of six picturesque bays with sparkling turquoise waters, backed by sheer cliffs that are covered in greenery. On its shoreline, the cool crystal waters are ideal for swimming and water sports. The resort hosts a wide range of amenities for young and old alike and has a fine selection of restaurants and is renowned for its fresh lobster. Corfu holidays have plenty to offer the visitor, with great sites to see both geographical and man-made. There are every type of water-sports, horse riding, boat trips, golf courses, sea fishing, jeep safaris and a multitude of activities to keep the most active of holiday makers happy. Corfu's rich historical past provides endless opportunities to see architecture, visit museums, and ancient archeology. 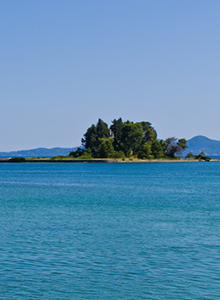 Our customers have recommended an island tour or car hire to see the amazing scenery that Corfu has to offer. Cultural sites on Corfu include the Archaeological Museum, the Museum of Asian Art, the 13th-century chapel on Mouse Island, and the neoclassical villa of Achilleion. Corfu may be one of the most developed of the Greek islands, but most of the resorts are set along the northern and eastern coasts, leaving the rest of the island relatively untouched.